Well, greetings friends! This is Herbert W. Armstrong with the Good News of the World Tomorrow. Yes. There is good news ahead and yet there is bad news ahead and that's the paradox. There's no good news today. There isn't going to be any good news in the immediate future. And yet, just turn on over beyond a little ways—and yet in our life time—and we're going to have world peace. We're going to have very good news. We've got a few lessons to learn first. My friends, you can know precisely what is going to happen. One third of the most, the most purchased book, I was about to say the most read book, I'm not quite sure that's true, but at least, the world's greatest seller, the most purchased book in the world — the Holy Bible — one third of it is devoted to prophecy. Almost one third of it and I mean about ninety percent of all prophecy, pertaining to our living, pulsating present and the next twenty-five years ahead. That's just the next few years in our lifetime. And much of this is going to happen within fifteen, sixteen, seventeen years from now — twenty to twenty-five years. Let me tell you we're in a mighty fast moving world. This world is marching on. Time certainly marches on. It's not just marching. It's speeding on now. Yes. We're in a mighty fast age. And I want to tell you, this world is changing. It's changing fast. You know where it's going? You can know. It's all here. "Then fear not, O America, my servant — [I'm reading this not in its symbolical language but in literal language as it really means — as interpreted by the Bible itself] Fear not, O America, my servant, saith the Eternal [but are we His servant? We're not serving God, my friends. We're trying to serve our own selves, at the expense of one another. But that's what He says]. neither be dismayed, O United States: for, lo, I will save you from afar, and your offspring from the land of their captivity..." (Jeremiah 30:10 paraphrased). That's speaking to the United States. Now my friends, that's pretty serious because there's a paradox — just ahead of it, it tells us that we're going into a time of trouble greater than any nation ever experienced in the history of the world. It's our national time of trouble. And it says that we're going into a national captivity and that we're going to be conquered. We are so used to conquering; we're so used to winning every war whenever we're attacked. And we don't do the attacking, at least not ordinarily. We have done a little attacking back in time past if you want to go back. Where did we get all this land? We took it away from the Indians, didn't we? I wonder if you realize that our fathers really are Abraham, Isaac and Jacob? And that's what He's talking about. And we're actually going back to Palestine. "And they shall take possession of it" (Jeremiah 30:3). Now these are the words which the Eternal spake, it says here concerning Israel and Judah but that really means concerning America, Britain, the democracies of Northwestern Europe and the Jewish people. My friends that's talking about something that is going to happen in about twenty years or less from now. You'd better be concerned. You're going to live into these times. This thing is going to happen. It's going to affect your life. You and yours. Your town. Your city where you live. Your home. "Alas, for that day is great. There is none like it. It is a time of distress for [America]; And yet, he shall be saved out of it. And it shall come to pass that in that day, says the [Eternal] of hosts, I will break the yoke from off their neck" (Jeremiah 30:7-8 ). Off of America's neck. That's Christ. At the time of the resurrection, David will be resurrected out of his grave. He'll be our King, but Jesus Christ will return as the King of kings — King over all. And He'll really sit on Jacob's throne as the King of kings over the whole world. Then comes this, that I did read to you, "Fear not O Jacob, my servant. I will save you from afar, your offspring — your children — from the land of their captivity, and we're to return but God says 'I will not leave you unpunished'" (Jeremiah 30:4,11 paraphrased). And He's going to punish us in love. You know, we certainly misunderstand love. I was reading in a book a little bit about what real love is. We don't seem to understand. Two young people think they've fallen in love and they want to get married. And, you know, about nine times out of ten, they don't even know what love is. Now he comes to something about love — and the Bible teaching about love. And he has a marvelous knowledge about it. Now just listen to a little of it. "The unfortunate fact is that the word 'love', has become so confused, so romanticized, so torn away from its biblical roots, that any modern author uses it at his peril." Then he says, "The New Testament uses three different words for 'love'". Now, remember the New Testament was written in the Greek language and he gives the three Greek words that are translated into the English word, 'love'. "But, originally, there were three words used. Eros, which means desire — not necessarily sexual, though it might be, and Philia, which means friendship. And then Agape, which is the Love of God for his creatures flowing spontaneously forth from His being — uncaused by anything in the objects of His love." In other words, God loves us. Not because of anything that we have done; or anything we have done for Him or to Him or anything, but He just loves us by something that flows spontaneously forth from His being uncaused by anything in us that we have done — the objects of His love. "The greatest emphasis is, of course, placed on the last of these terms that I've just now defined, which Christians are bidden to manifest toward one another. That's the kind of love we ought to have. Now, the important point of all of this is that love is not, in biblical terms, an emotion." Now, this man is certainly not a fundamentalist, who wrote this. He is an intellectual and an educated man but I want to say this: That no fundamentalist minister could have a much better understanding of love than this man has, and I mean "love" as it is taught in your New Testament. And this makes sense, listen. "The important point of all is that love is NOT, in biblical terms, an emotion." Now, why many religious denominations today seem to accept "love" as if it were an emotion, many a young man thinking he's in love with a girl, it is merely an emotion and he confuses that with "love" and it might actually be lust and he wouldn't know it. "It is an orientation or attitude of the total personality, heart and soul and mind and strength. It is an outgoing concern for what is loved that seeks to serve and to give. That's what "love" is." That isn't what most people think of love, though. "It has an emotional content, to be sure. That is, it might provoke emotion. Emotion might be a reaction. Emotion might result." But the emotion, my friends, is not the love. And love, true love, as the Bible teaches it, is NOT emotion. It may have an emotional content. "Without the driving force of feeling it would be coldly and barrenly intellectual. But neither is 'love' without its rational aspect. It involves the whole of personal life. The distinction drawn by modern psychology between infantile love and mature love is illuminating at this point." Now, maybe these are modern psychologists. Maybe they're not fundamentalist Christians. But they have, in this one case, at least, a very scriptural idea and attitude of what is true love. And this is very good. And as a minister of Jesus Christ, I want to give it to you, even if it does come from psychologists that don't know too much about the Bible. "The distinction, now, between infantile and mature love [now let's get it] the former, that is infantile love, is almost solely emotional and it is extremely selfish, seeking, primarily, its own gratification. It does not love another human being as he really is, but as an ideal image, an image of the person, as the lover wants or needs him to be. Many a chronological adult simply transfers his infantile love for his parents, to the object of his later affections." Maybe the boy or girl he thinks he's in love with, or she thinks, or some other person or thing. "She or he is regarded as the most beautiful, the most intelligent, the most charming creature in the world. She is not loved for what she is but for what her lover wants her to be. She is, as the mother is to the infant, simply an extension of his own ego. He must believe that she is so remarkable because only such a creature is worthy of his 'love' because of his own vanity. And it would hurt his vanity to think that she wasn't so wonderful. Otherwise she wouldn't be worthy of a love so great as he thinks he is or a person as great as he thinks he is. Illusion is the standard diet of infantile love. It is, as the poets say — blind. It is so preoccupied with its desires and wants, its feelings and reactions that it cannot see the beloved at all. The infantile lover is so busy enjoying himself in his friend's company that he cannot enjoy his friends. He just enjoys himself in their company." It's all selfish. It's all ego. It's all vanity. And, my friends, the very principle of the transgression of the Law of God — which is LOVE — God is love, and God's Law is love, and LOVE is the fulfilling of God's Law, then the opposite way is the opposite of love. And do you know how you break God's Law? What is the opposite then, of love? Vanity, egotism, selfishness, greed. And I don't believe you can find very much of anything that transgresses the Laws of God that isn't along the principle of either vanity or greed, ego or selfishness. "The infantile lover is so busy enjoying himself in his friend's company that he cannot enjoy his friends. He defines love in terms of HIS inner response. It is a tickly feeling around the heart that you can't scratch. It is ephemeral and unpredictable. It comes and it goes without warning. This is love as it is understood by many a modern, as it is counterfeited in a highly sentimentalized and even more highly eroticized currency popular on stage and screen. You see a lot of this kind of lovers and loving in movies and in television, and in romantic songs and magazine stories. Cupid appears, appropriately enough, in diapers, because it is infantile love." "Mature love, in contrast, is not blind. It has progressed from pabulum to porterhouse. It feeds upon the raw meat of reality. The beloved is seen as he really is — with all of his faults and liabilities, as well as his capabilities and assets. He is loved for himself, as he is, in full awareness and recognition. And what the mature lover seeks is not primarily his own satisfaction, the gratification of his own desires or the titillation of his own feelings. He wants to serve the beloved. He wants to serve the one he loves. That's true love." You know, God loves us and He wants to serve us and that is why God is about to punish our nation? Because we have to have it to save us from ourselves. Because God loves us and that's the only way He can serve us. My friends, God is warning this nation through my voice now. He has warned it through many another voice. God warned the world through His prophets of old — they stoned the prophets. He sent His son to warn the world and to tell them the true way. They crucified Him. Yes, and He's had His ministers since but the people don't listen to that kind of preaching. And now, God — in love — in order to serve us for our own good, is going to punish in the only language that you people — most of you and most of this nation — will understand. Physical force and punishment. And there you are. "He wants to serve the beloved to contribute to its fullest self-realization, the true lover, the most creative fulfillment of the other and he is willing to undergo considerable sacrifice to achieve his goal. This has a close analogy in the love of a parent for a child. That is at least a normal parent to a child — an active, outgoing concern. It springs from an inner strength. From the ability of the willingness to serve needs of the other." Now, one of the chief difficulties with marriages, based upon infantile love, as so many marriages are, is that both partners are expecting to receive all and to give nothing. You know, as a minster, my friends, many married couples have come to me with their problems. Their marriage isn't working out. What are they going to do about it? Well, I could help them; if they'd let me but very seldom will they let me. I can turn to the husband and I can find where it's partly his fault, and I tell him what his faults are. And I'll say to him, "Now, look, half of the whole problem can served if you will acknowledge where you're wrong and if you'll straighten out your own self. If you'll begin to be a little bit considerate for your wife instead of thinking only of yourself and what she means to you and what you can get from her." "No", but he says, "Let her do it first and then maybe I will." Then I go to her and tell her where her fault lies and that she can straighten out half of it, and that would be the other half. If she will work on herself and correct her faults, then maybe he will. "Ah, let him do it, the old beast." You know, she isn't willing to admit a thing. No Sir. She sees his faults so big that she can't see any of her own. And usually, there is a total unwillingness for either one of them to bend. So the marriage never is salvaged. Not unless they'll give in. Now you should start out a marriage in the right way in the first place. "When a marriage is based on this infantile love, of wanting to receive all and give nothing, it hasn't got much of a chance, because a real marriage ought to be based on love. This kind of people are so devoured by their own hunger that they have no awareness of the wants or needs of others or at least no ability to do anything about them, so life is a constant struggle. Each fearful of having demands made upon him, which he cannot meet. Each asserting his own needs or his wants as imperiously as a squawking child." That happen in your home? I know that it happens in the homes of a lot of you people listening. "Mature love wants to serve, having learned that Jesus was profoundly right in recognizing that it is more blessed to give than to receive. It isn't wrong to receive, but it is much more blessed to give - to love than to be loved." You ever think about that? Do you just want to be loved or do you want to love and to give love? "The more one bears the burdens of others, the more he contributes to his own strength. And he who is a servant of all is truly the greatest of all. The mature lover, then, knows his own weaknesses and is not ashamed to accept help when he needs it, but he also knows his capacities and is glad to put them at the service of the other. Infantile love regards people as a means of satisfying its ends and uses them indiscriminately. Mature love, real love or Christian love, recognizes and values persons for themselves. Now, the forgoing distinctions between mature and infantile love on the one hand and an I-thou and an I-it relationship on the other, have, it is to be hoped, clarified to some extent at least, the meaning of love in its biblical sense as Jesus used it." And in this case, this man even though he's not a minister and he certainly is no fundamentalist, apparently, and yet he has marvelous understanding of the Bible teaching of love. "Love for him meant, not primarily a romantic emotion but concern and respect, devotion and a desire to serve. God's love was not, in His teachings, sickly sentimentalism seeking the happiness of men without regard to the cost or the consequences." "All of this needs to be kept in mind in what he..." Well in his following discussion and that's the end of that phase of it that I wanted to read. Now, my friends, it is out of a great concern for us. God loves us and He knows our every weakness. He knows our every fault. He made us. He put human nature in us and He knows what it's done to us. And He knows how far short we've fallen. And yet, God so loved the world that He GAVE — not that He TOOK, but He GAVE His only begotten Son, that whosoever believes in Him should not perish, but have everlasting life (John 3:16). And that same God says He's going to save us but He will not leave us altogether unpunished. And it's all in love. Oh I wonder if we can understand it. He says this to our people of the United States. This is for us today, my friends. This is a prophecy. This is not some old dead and gone ancient history. This is alive, living prophecy, an energized prophecy under the inspiration of God Almighty and it's for us and this is the message of God. This is the "Thus saith the Eternal." We don't believe that. We've more crimes in the United States than any nation in the world or than has ever occurred in any nation. And once again, let me just tell you, as I have said before, that since I've been speaking to you ON THIS VERY PROGRAM, there have literally been dozens and scores of major crimes committed in these United States. Our moral bars are lower. Our standards are sinking down, sagging down into the muck and the mire. Divorce and remarriage, juvenile delinquency. And now I want to tell you that one of the greatest problems facing this nation right now, and it's rising by leaps and bounds, is the dope habit that is getting our young High School children. Are you teaching your children anything about it? Or do you think, "Oh, it couldn't happen here. The less said the better." You better teach your children a few of these things. Because that's one thing that is apparently is absolutely incurable. It's one thing that I know God Almighty can cure because He can cure anything. But those that don't know God claim that it is absolutely incurable. They don't seem to know of any cure whatsoever. Well, God says we're going to be dealt a terrible blow and punishment. He's going to punish us because our sins are so flagrant. Or in the King James Translation, "...because your sins were increased." (Jeremiah 30:14). And I read you not so long ago, on this program, the exact statistics of how crime and how all of these things that are sins in God's sight are increasing in our nation. They are increasing, my friends, by leaps and bounds. Now, my friends, listen, you cannot understand the Bible unless you understand that third of it — the neglected third, that is devoted to prophecy. Do you realize my friends that approximately one third of your Bible is devoted to telling you what is going to happen in this world within the next ten, twenty or twenty-five years? This is the third of the Bible that is least understood that has been neglected. Now you can't understand it unless you have the key that opens it up, today. And that Key is revealed in a special booklet that I have for you. 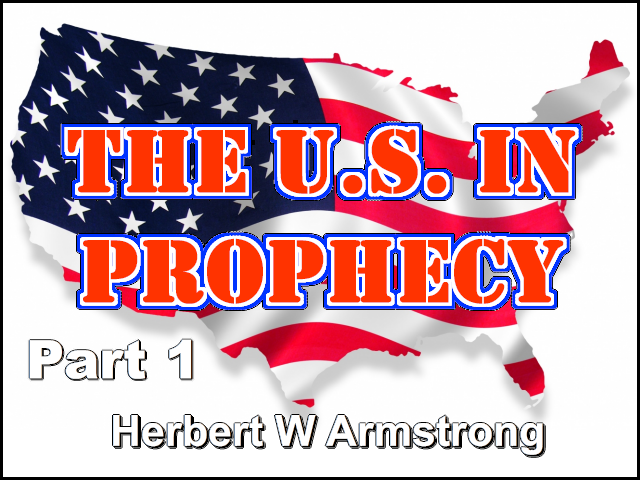 'The United States in Prophecy' — that includes, also, the nations in Northwestern Europe. Where are we mentioned in the Bible prophecies? My friends, we're mentioned more often than any other nation but God has kept that knowledge closed until now. It has been sealed. But now it's open. That is a veritable key by which you can understand the prophecies of your Bible. It will open up as a great treasure house of information so you can understand the events taking place in the world today. Now listen, I want you to sit down right now and to write in for two very special booklets. Now listen carefully. You must ask for these booklets by name. First, 'Why Were You Born?' This lays down before you the whole purpose of life. It lays down the whole of the whys and wherefores of this thing that we call salvation. Why do we need it? And just what is it? What do you get and how? Why does God permit wars and so much human suffering, heartache, fears and worries and all this type of thing? Empty lives, why does God allow such suffering in this world? And what is the purpose being worked out here below? The name of this booklet, 'Why Were You Born?' Now jot that down immediately. Now the other booklet, 'All about Water Baptism.' Just write in for the booklet on water baptism. Now, this booklet — a very attractive booklet — explains the way of salvation. It completely answers the question, is water baptism essential to salvation. It explains the way of salvation. It explains about the thief on the cross. Was he saved without water baptism? Now he had no opportunity to be baptized in water. Could he be saved without it? What is the proper form, mode or way of baptizing, if it is now in force and effect and a condition to salvation? Is it sprinkling, is it pouring or is it immersion? I wonder if you understand all of that. These booklets, my friends, will make it very plain. Now first, here's this booklet, 'Why Were You Born.' And the other booklet on water baptism. Until next time this program is on the air, this is Herbert W Armstrong saying "Good-Bye friends."